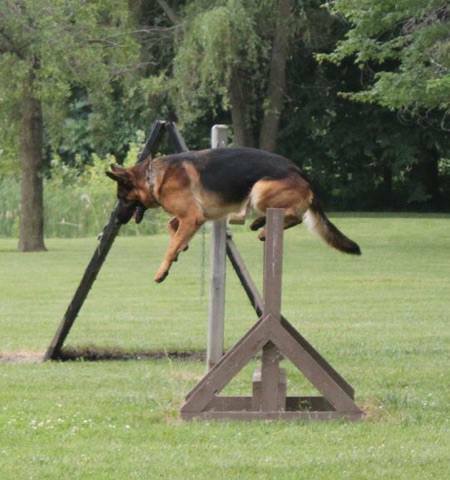 The Level III dog is trained to do everything the Level II dog does as well as transport the attacker anywhere you wish to go. The Level III guard-dog is not your typical housedog; it is a working dog. Although it can be integrated into a family, it is not a social dog; its main purpose is protection, not a pet. 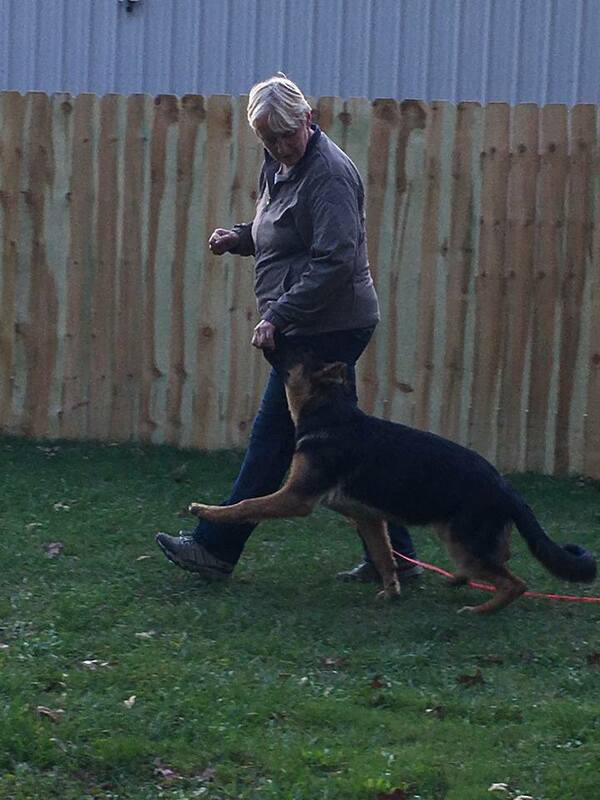 vom Dinaburg Shepherds can provide you with a dog—or work with your existing dog—to meet your specific needs. How having your dog properly trained for obedience can affect your life. I find that the most important aspect of owning and training a dog is recall—your dog returns when called. So many times I have met with people who tell me that this is their number one concern. It is difficult on both the dog and the owner if the dog must be constantly confined because the owner has no confidence that the dog will return when called. I hate to imagine the stress (and trauma) caused by a dog running towards the street that will not come back when called. In addition to returning when called, your dog should sit, lie down, stay, and walk with you naturally, without any coaxing or fighting. I can’t tell you how many times people have told me, “When I have guests over my dog will not leave them alone so I have to put the dog away,” or how many times I have seen an owner and a dog on the street, but cannot tell who is walking whom. If you can relate to any of the above problems, I can assure you are not alone. It is also safe to say that there is room for improvement in your current relationship with your dog. Having a dog that you can trust to behave is a dog that is free of restrictions and won’t cause you unnecessary stress, or itself undo harm. It is at this time that the dog becomes a true member of the family, because the fully trained dog does not need constant commands; he is his own being and is the perfect companion. 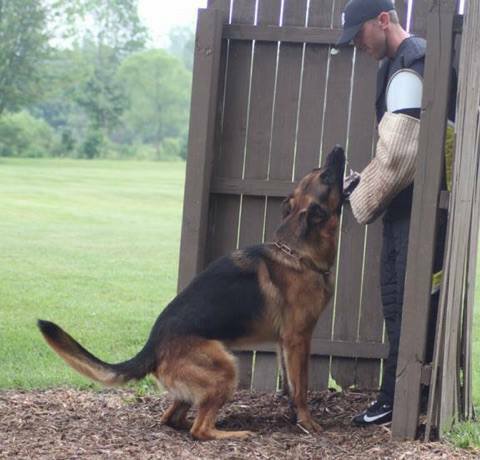 What is most important in guard training is the understanding that not every dog can be trained for protection work. The dog must have a very stable and sound character. The dog must also have the ability to distinguish between threat and non-threat. You cannot train a dog to have these qualities; it comes from the breeding of the dog. When training a dog for protection, you enhance and control the dog’s natural instincts to protect. You also enhance the relationship bond between the dog and its family. There are three different levels of training for a guard-dog. The Level I dog is a dog that is very social and friendly to strangers; your typical good-natured housedog. This is a dog that no one will expect is guard trained unless you fall victim to an attack. 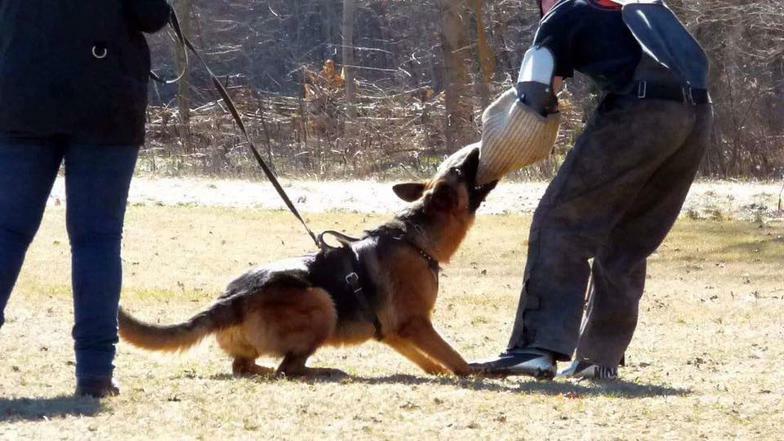 The instant your safety is compromised, a simple command will instruct your dog to restrain the attacker with a “bite and hold” technique. When commanded, the dog would release.